Progress means making fewer mistakes. Some typical mistakes disappear at a certain level. A player of lower rank might get it right, of course, but a player of higher rank never gets it wrong . For example, I noticed that IGS 6k* (3k* at present) quite often make the following error. At some point of the game White decides to save . But is a mistake. 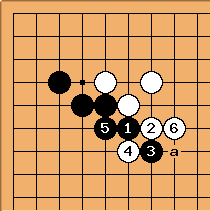 White cannot play hanetsugi a now: Black has hane b that leaves White with a ridiculous shape. At IGS 5k* (2k*) level this error did not occur anymore. is the correct way to save . 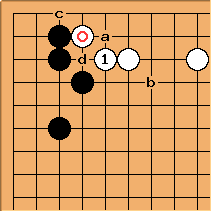 Charles Or at a: White at a means that Black at b is less of a forcing move. But it claims one point less. Andre Engels I think the difference is considerably less than a point, since after white has played the hane and connection at c, d will be black's sente, taking away that point again. I personally always play a, never . Charles Me too. I could find just one pro example of precisely this position. It seems that Yu Ch'ang-hyeok disagrees with us. jwaytogo As I recall, my former go teacher, who is 6p, also reccommends "a". The correct reply is sagari at a. The difference is very small, but giving the opponent a chance for a point without strong reason is bad. Knowing these moves does not make anyone a 1k* or 2k* player. Progress to this level includes many such small points but if anyone misses the correct answer here, he or she is weaker for certain. Bildstein: I'm 1k* on IGS, and a local 3 dan at my club, who is stronger than me, thinks is correct. 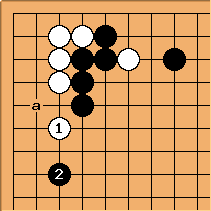 I recently heard him explain it to a weaker player, explaining that it could conceivably lose a point, but it leaves the opponent with fewer ko threats than the sagari. This is a counter-example to the "a player of higher rank never gets it wrong" statement. It looks like strength is still an elusive beast. Vincent: I would play a as an endgame move since there will propbably be few, if any, ko's left. 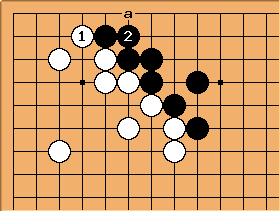 If it is still relatively early in the game I would play using the same reasoning as your 3 dan. Bill: loses 1/3 point, on average. That is usually more than a ko threat is worth. I think that the 3 dan is getting confused with this kind of situation, where a dominates if there are no kos. kevinwm: The only exception I've found to this is if the black group on the right is short on eyes. If black cannot respond to white d19 with e19 (because of the follow-on f19 atari), then b should play e18 instead of e19. Please, bring and post here some other level indicators. ilan: I've recently noticed that in some situation where there isn't so much room (for Black here), playing at a gives better prospects for making life. The idea of a level indicator for me applies in games against an unranked player on the net. How strong would this guy/girl be ? Reading the angle play link, I'm not sure WHY this play is a bad one. Can you please explain why in this situation, angle play was 'cursed' ? The reason they call it a "cursed" angle play is because here it makes the same shape as if you had ignored a shoulder hit. Bill: is not necessarily bad, depending upon the surroundings. 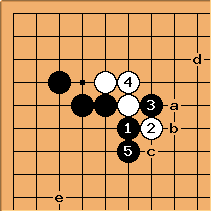 However, Black will normally be able to push the White group around, because of its relative weakness. 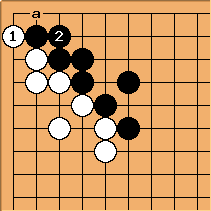 For instance, Black might play at a to make thickness. And it is dangerous, some players have what I call an "Internet style" : a lack of theoretical knowledge, but many games played and some fighting strength, mainly in fast games. How irritating to lose against someone who plays such angle plays! Djaian: It happened often to me to think "mmmh, this move is bad, my opponent is weak, I am going to win (easily)". Now, when something like that happen, I prefer to remember the proverb "if your opponent is officially same level as you and seems weak in the beginning, then he must be strong in middle game and yose." Thinking you are going to win because you have deeper theoretical knowledge in the beginning is a mistake I will not make anymore (yes, I suffered many losses because of such thoughts). No idea exactly what kind of level indicator is this, but I don't think this is seen in the single digit kyus. Klaus: I have seen an 6 kyu player playing the contact at quite often. 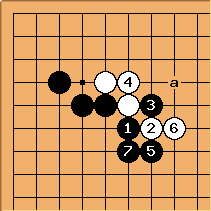 (without a stone at a of course, ande he still plays like that even though some players tried to explain the mistake to him...) So I guess it is not an indicator for a double digit kyu. Paul Clarke: I regularly see both and from players of around British 5kyu strength. BobMcGuigan: I wonder how well a person's over-the-board strength can be characterized by presence or absence of characteristic moves. Phenomene has mentioned internet players who make theoretically bad moves but win a lot of games because they are good fighters and can handle fast games well. I used to play a lot with a Korean man whose office was down the hall from mine. He had a 3-gup ranking (which he had earned 50 years ago) but had never studied seriously or had formal lessons. He made a lot of bad moves but he was a ferocious fighter and won a lot of games despite the bad moves. I had to respect his brute force strength but I often wondered how much stronger he would be if he knew more about good style. unkx80: Or consider to get ahead, usually better than a.
Alternatively, tenuki and leave the possibility of , which aims at the placement at a.
Charles See also related analysis at aji keshi. Vincent: Gote? Are you sure? 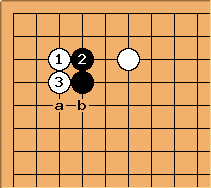 I would say white almost has to play a to capture the cutting stone, giving black sente. 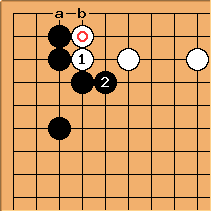 In the 2nd diagram, Black's 5 leaves white to decide, play at a and give up Sente, or leave the potential ladder at b.
Imagist It seems to this lowly 5 kyu that the issue is not whether or not white should capture the cutting stone, but whether black wants white to capture the cutting stone with a net or a ladder. The atari forces the net, while the extension forces the ladder. 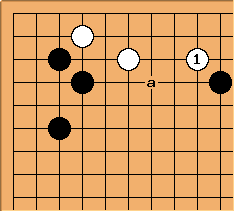 If black can make use of a ladder breaker in the d area, black should play , whereas if thickness toward e would be more useful black should play at c. If it is not yet clear which would be more useful, in the diagram above leaves the situation flexible so that black can choose which move to play later. 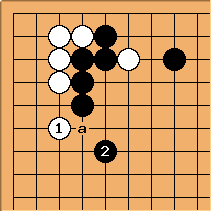 Chris Hayashida: Is it possible that you are getting the position mixed up with something from this joseki? is proper, a is not. Imagist: At the lower levels (my level), this play against a 3-3 invasion usually indicates that someone hasn't devoted much time to joseki. Obviously this is a meta-indicator and is very hard to detect in an actual game, save perhaps when playing the same person many times. Djaian: A few years ago (let's say during the year 2007, to be more precise), I noticed that in the following position, KGS players weaker than 5k tend to play a rather than the correct joseki move b (black to play). However KGS 3k always played it correct. 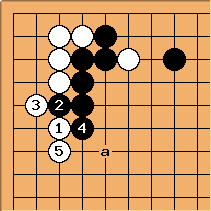 Now (June 2009) it seems the limit where people know or not the joseki is more around KGS 7k. I have seen KGS 9k players doing it correctly. 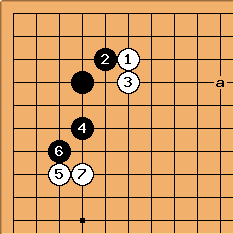 However, I am not sure a 7k knows how to punish the move at a. 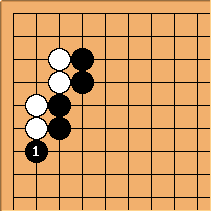 Furthermore, you can often see KGS 10k players choosing another move than a or b, like a contact move on the lonely white stone. I think 90% of KGS 5k players play b.